I’m literally falling asleep while I type this…I cant’ believe I got the text on this sketch. O_o Oh lookie~ Color. *giant yawn* This weekend off thing has really thrown me out of whack. Is the guard’s name Peter? Regarding the comment today: Yeah, sorry, that was me who linked to your comic. I don’t know if I got the whole thing between Janus and Geoffry right, but I thought it’d be funny to call it stokholm’s syndrome. I’m a big fan of the comic, by the way! I also endorsed it on the Skin horse forums a while ago… I really like your stuff and I know a number of my friends there are also fans. Thanks for putting up such a fun comic! No need to apologize; I was flattered WAM was getting used as an example. :) So thanks for reading! 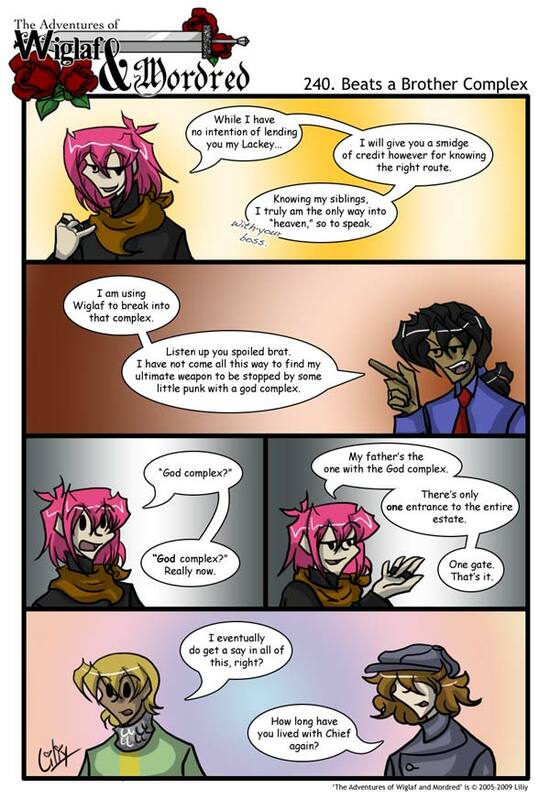 hehe….God complex…well..yea. beats brother one. By miles.